In 1896 Dom Eugenie Faria Ganzales de Teixeira, Marquis of Aguila Branca arrived in New York City with his children and mother. Nothing made Manhattan society giddier than a foreign title and the colorful Brazilian would take the city by storm. 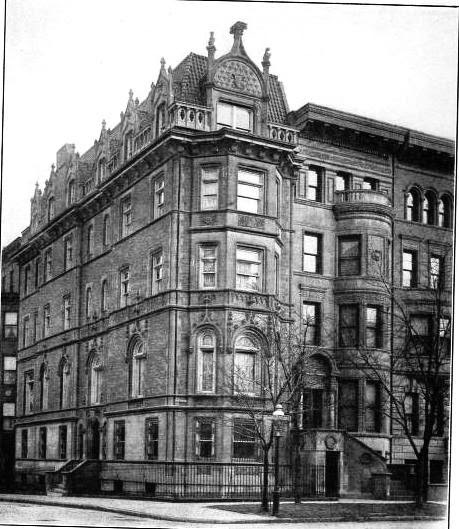 A year earlier builder-architects Horgan & Slattery had paid J. Hamilton Hunt about $80,000 for the property at the southeast corner of West End Avenue and 105th Street “for immediate improvement,” as reported by the Real Estate Record & Builders’ Guide on March 10. Lavish mansions rivaling those on Fifth Avenue were inching up Riverside Drive, one block to the west, and the speculative developers intended to ride the coattails. The Marquis had studied art and architecture in Brazil. He moved into Horgan & Slattery’s unfinished mansion, announcing “that he would furnish the house at 918 West End Avenue just like his palace in Brazil, except for the atmosphere left by the personages of Dom Pedro’s other worthy descendants,” according to The New York Times a few years later. “He painted his own frescoes, designed his own windows, and even made models of the great iron dragons that lent dignity to his front door. He told of how his home would be the centre of Brazilian art and music and culture.” The Marquis installed a chapel in an upper room. One visitor described: “The house, the interior of which the Marquis designed, is a unique example of the art of the different periods, alternately whimsical and fanciful. No counterpart of it exists in New York.” Some art and architecture critics would later agree that that was probably a good thing. A contemporary account called the Marquis a “poet, linguist, artist, architect, and scientist, with whose breezy career New Yorkers are familiar.” He worked on completing the house for months. Newspapers gossiped about his fortune, estimating it at between $50 and $100 million. What was certain was that he had spent $50,000 on the West End mansion before furnishing it – about $1.5 million today. The Marquis added to the financial mystique through his boasts and self-applauding accounts of his lavish lifestyle in Brazil and of his being closely related to former Emperor Dom Pedro II. But Teixeira soon discovered that publicly announcing vast wealth attracted problems. While work continued on the mansion, he met Carmen Domingo whom The Times called “a Spanish woman of beauty, who listened to his story of fabulous wealth, and told the story of her young life, in which she said that she was engaged to a Mexican she did not love, and prayed the handsome young Brazilian…to save her from unhappiness.” The 33-year old Marquis did just that. On January 14, 1897 the couple was married. But before the year was up he recognized that it was not his poetry, scientific knowledge nor sparkling personality that had lured the senorita. It was money. Finally the house found a long-term owner. By 1910 the family of William Bentley Quaintance called No. 918 West End Avenue home. Quaintance was an importer of “madras and muslin piece goods and fancy nets” and spent a reported $20,000 on the interiors. The family would remain in the mansion for years; yet by 1914 when William Quaintance bought his new Cadillac motorcar, things were changing on West End Avenue. 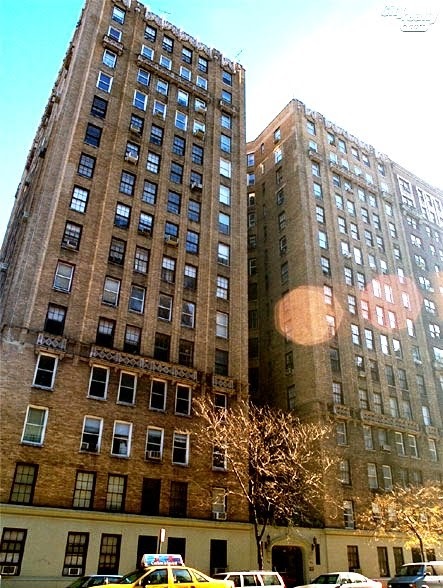 Grand mansions were giving way to upscale apartment houses. The family would stay on at No. 918 throughout the World War I years; but the end of the road for the opulent house was on the horizon. William’s sons entered the military. In 1920 25-year old Charles Linsey Quaintance was a Second Lieutenant in the Aviation Section of the Signal Reserves Corps; and his younger brother, Richard Edgecombe Quaintance, was a First Lieutenant in the Field Artillery Section. 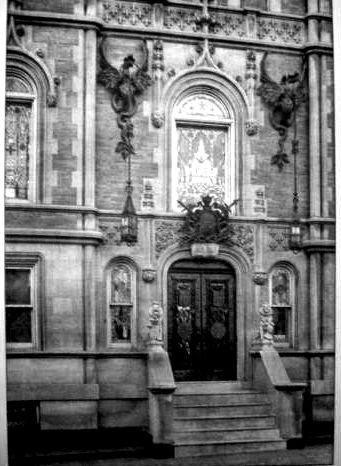 On November 27 that year the Record & Guide reported that their father had sold the West End Avenue house to Joseph S. Ward. Once again the mansion saw a rapid-fire series of sales. Within two months Ward sold it to Gustav Sandblom, who resold it a month later, in February 1921. By July it had been divided into apartment suites; but its days were numbered. By 1925 the quirky mansion with the colorful past had been razed and in its place stood a 15-floor apartment building designed by George Fred Pelham. You learn something new everyday and today I learned about this opulent townhouse a complete surprise to me. Very interesting and what a great entrance that had to be once you walked past the front doors.